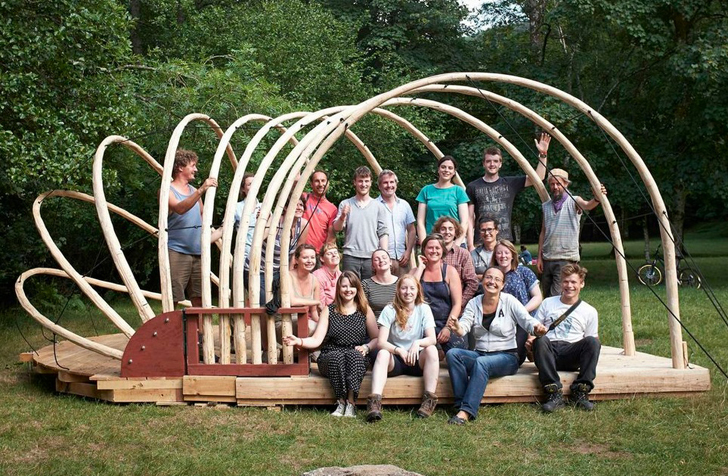 London-based Jerry Tate Architects worked with the students at this year’s Dartmoor Arts Week summer school in Exeter, UK to build a charming theatrical reception space. The collaborative effort resulted in a demountable pavilion made from locally-sourced larch wood. The pavilion built in only six days can be reassembled in under five minutes by two people and transported to its next location with a small trailer. 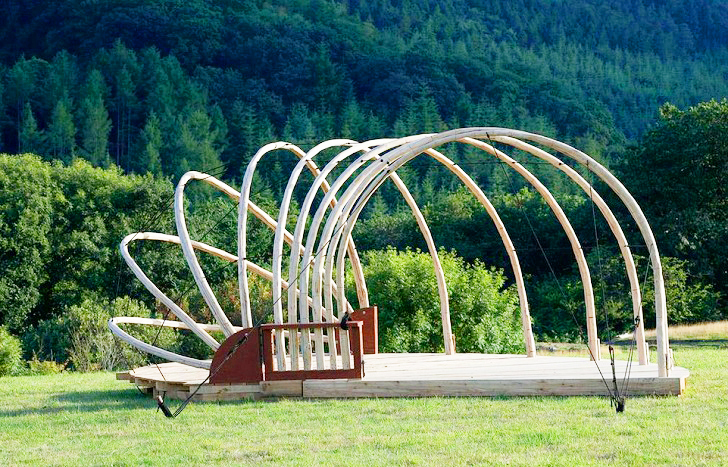 Installed on a curved base platform, the shell-like structure is formed by ten crescent-shaped ribs, with timber poles tethered by nylon cords anchored into the ground. The project was conceived as a learning exercise for students, who developed a series of maquettes before deciding on the final design. It has been three years since Jerry Tate Architects started their collaboration with the Dartmoor Arts Project. Last year’s Treehouse project, which was inspired by bird nests, was also built from locally-sourced wood for only £500. This is what one student said about the project: ‘An incredible and unique experience, so much fun, great to work as part of a team during an intense week seeing it from design through to construction.’ Another said, ‘Working as a group is very energizing and totally rewarding-a special course that allows complete development from concept to construction’. London-based Jerry Tate Architects worked with the students at this year’s Dartmoor Arts Week summer school in Exeter, UK to build a charming theatrical reception space. The collaborative effort resulted in a demountable pavilion made from larch wood. The pavilion is installed on a curved base platform. The shell-like structure is formed by ten crescent-shaped ribs, with timber poles tethered by nylon cords anchored into the ground. The project was conceived as a learning exercise for students, who developed a series of maquettes before deciding on the final design. It has been three years since Jerry Tate Architects started their collaboration with the Dartmoor Arts Project. Their Treehouse project from last year, which was inspired by bird nests, was also built from locally-sourced wood for only £500. Students called the project ‘An incredible and unique experience, so much fun, great to work as part of a team during an intense week seeing it from design through to construction’ and; ‘Working as a group is very energising and totally rewarding-a special course that allows complete development from concept to construction’.